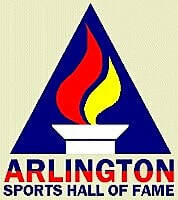 At the Better Sports Club October 10 dinner program, the Arlington Sports Hall of Fame 2018 inducted four new members. An outstanding gymnast at Yorktown High School, Joe developed boys and girls gymnastics programs at Wakefield, Washington-Lee and Yorktown. His gymnastics teams have won numerous district championships, three regional championships and two state runner-ups. He was head coach of the Virginia High School Mens Gymnastics Team from 1992 to 2002, winning the National Championship in 2002. Joe is the Founder and Director of the YMCA Woodmont Gymnastics Center, which includes both recreational classes and competitive teams. He was named the Arlington Coach of the Year by the Better Sports Club at the 2012 Awards Banquet. Currently, Joe serves as the ASHOF Treasurer. Heather Cocozza was Joe's sponsor and presented his ASHOF plaque. Bill was a star football player and track & field runner at O’Connell High School and was in the first graduating class in 1961. In high school, Bill set records in the 100-yard race at 10.0 seconds and in the 220-yard race at 22.2 seconds. He set an area record in the 440-yard sprint with a time of 49.5 seconds. Bill was named to the first annual All-Metropolitan Track Team chosen by the Area Track Coaches Association. He received a track scholarship to LaSalle University in Philadelphia, where he had an outstanding track career. As team captain, he led his team to successive Mid Atlantic Conference (MAC) Track Championships in 1964, 1965 and 1966. Bill was a three-time MAC Champion and was inducted into the LaSalle Track Hall of Fame in 1993. He is in the O’Connell Sports Hall of Fame as well. Bill passed away in 2017. His Hall of Fame plaque was presented to his widow, Patricia, by John Depenbrock, who sponsored Bill’s nomination. Mary is a competitive swimmer in freestyle, breaststroke and backstroke. She is a 25-time gold medalist at the Virginia Senior Games and a five-time qualifier for the National Senior Games. Mary is an accomplished open-water swimmer. In the past year, she was the second-oldest finisher at the Alcatraz Escape From the Rock swim across San Francisco Bay. In soccer, she is a nationally-recognized goalkeeper with a 36-year career in Arlington and Northern Virginia leagues as well as national tournaments. Mary became a triathlete at age 50, and has completed 16 events. She coached girls and boys soccer at Williamsburg Middle School where she compiled a 92-4 record as Williamsburg’s girls coach from 1987 through 1999. Mary Schade continues to inspire Arlington with her athletic achievements. Mary accepted her ASHOF plaque from her sponsor, Burt Bostwick. A lifelong Arlington resident, Peter attended the Landon School in Bethesda where he was a standout runner as a 1,500 meter champion and was named to the All Interstate Athletic Conference (IAC) cross-country team. He attended James Madison University in Harrisonburg, Virginia, and won the Colonial Athletic Conference (CAC) cross country championship three years in a row. He set records at JMU in the outdoor 1,500 meter race and the indoor 3,000 meter race. Peter was named to the CAC Silver Anniversary Team and was inducted into the JMU Sports Hall of Fame in 2017. He has spent the last 25 years working for Arlington Public schools. Fran Vitt co-sponsored Peter’s nomination and presented the ASHOF plaque to him. With the induction of these four individuals, there are now 44 Honored Members of the Arlington Sports Hall of Fame, which began 60 years ago in 1958 with the first inductee, baseball star George McQuinn.